What’s It About? : Rich man Colin (Romain Duris) has a pleasant life, he is served delightful food from his in-house cook, enjoys his pianocktail (A piano that makes cocktails by playing it) and has a great friend in Chick. At a party, Colin meets and falls in love with Chloe (Audrey Tautou). After a whirlwind marriage, Chloe contracts a flower in her lungs whilst on their honeymoon. As time passes, Chloe’s condition gets worse and Chick’s relationship with his girlfriend turns sour. Colin has never dealt with this much heartache. Verdict: Director Michel Gondry returns to his native France, after his Hollywood forays over the past 10 years, to take on adapting Boris Vian’s 1947 novel ‘Froth On The Daydream’. 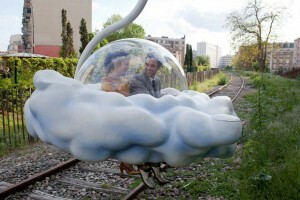 As to be expected from Gondry, there is a straight narrative but it isn’t in the formal sense. Instead we are instantly catapulted into a world where legs bend & stretch whilst dancing and where a house mouse helps with the cooking and cleaning. Initially it’s very disjointing when trying to view the film as real life, but it doesn’t take long before an active imagination takes hold and transports you to a film universe that doesn’t adhere to everyday rules. Gondry doesn’t use modern day CGI, instead opting for the old fashioned end-of-the-pier type trickery in his working of scenes. Sets bend and shake with elasticity than makes it feel as if the film and the mind are moving along with it. Even the drabbest of set designs sparkle with illuminating brilliance that can be as transfixing as the main story. Being transfixed by the visuals is one thing, but Gondry also makes sure that the storytelling is just as impressive and important. His use of metaphors brings about the ability to finally see real life in some of the cherished moments that Colin and Chloe experience alone and together. They frolic with careless abandonment until struck down with the serious side of the story, a side that rings hard and true for those seeing the film who have felt emotion like Chloe does. We develop an attachment to these two lovers that appears greater than some of our friends in real life, we can only hope they succeed in their journey of life together as they are ill fitted but also perfectly suited. Romain Duris’s hopeless romantic Colin is the type of person we all know – A day dreamer and a bit of a wet fish. Duris’s facial expressions and childish actions mark him out as some who can cross between fun and mishap with ease. Audrey Tautou’s Chloe is the demure of sexiness, as she playfully taunts with each scene. Wonderful support comes from Omar Sy as Nicolas, possibly the only sane character in the film as he serves food and life advice. When Gondry is left to his own devices he creates an idea into a film that shouldn’t work. But his no-limits thinking means his ability to transcend boundaries creates a thrilling viewing experience that is unlike any we are used to. Final Words: Classic mise-en-scene from Gondry and beautifully heart-warming moments from Duris and Tautou create a floaty dream-like film that will never leave your subconscious. It’s a feast for the eyes, ears and the soul. Mood Indigo is in UK cinemas from 1 August 2014.